Open Security Research: FreeRADIUS-WPE Updated! A couple years ago Josh Wright and myself created FreeRADIUS-WPE (Wireless Pwnage Edition) for attacking WPA-Enterprise clients. It doesn't always need to be updated, because FreeRADIUS is a pretty solid RADIUS server, however I was recently contacted about WPE not working well with clients using Windows 7's supplicant. Rather than troubleshoot the problem using the old version, I updated the patch to support the most recent FreeRADIUS release. 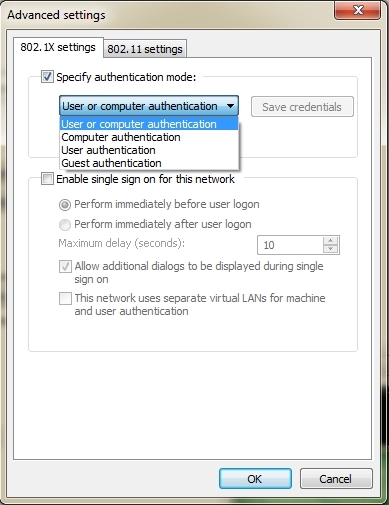 Under "Advanced settings", "802.1X settings" there is a "Specify Authentication mode" option (shown in the image below). This the default value is unchecked. 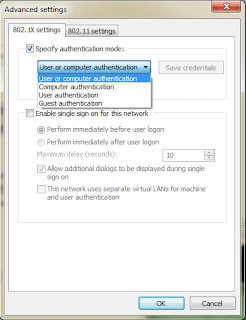 I've noticed that unless this option is checked and the drop down is set to "User or computer authentication", or "User Authentication", FreeRADIUS just denies the connection. I'm looking into if there is any way to address that but as of now, this setting has to be set in order to reliably work. If you're using the .deb, it has been tested with BackTrack 5 R1, but will likely work with other versions and Ubuntu/Debian. feel free to backport it. I installed everything as you've outlined and it is working fine...except that the log file "freeradius-server-wpe.log" never gets generated. Instead, a log file named "radius.log" appears in the log directory, but does not contain the Challenge and Response data...any idea what I'm doing wrong?? I'm running BT5 R1 KDE and a Windows7 wireless client. I just patch everything in my BackTrack R1 , but when i try to conect the "users" file does not accepts authentication for any username. When i add a user to that file it works fine. Any ideia why it´s not working? Hi.. I'm having the same problem as Brian.. can't seem to get it to write out the wpe log. I've doublechecked my paths and permissions and they look fine. Any thoughts? Anonymous, are you getting a "Rejecting unknown client" error? if so, you need to amend your clients.conf file to reflect the network that your AP is connecting from. Mine was using 192.168.1.1, and there was no definition in the file for that network.. once I added one, it worked great. Hope that helps. I have tried installing, but when I try running radiusd -X, I get the following error: Could someone please assist? I am running out of ideas. ...............Child PID 7198 is taking too much time: forcing failure and killing child. /usr/local/etc/raddb/eap.conf: Instantiation failed for module "eap"
/usr/local/etc/raddb/sites-enabled/default: Failed to load module "eap". /usr/local/etc/raddb/sites-enabled/default: Errors parsing authenticate section. also having an issue with the log file not being created.. BT R1 / Win 7 client with 'User or computer authentication' explicitly specified. I can see the client attempting to connect in the debug log, (failing obviously) but no dice with the logging..
Basically need to patch hostapd and recompile it (make, make install). After this running radius with wpe patch and hostapd with wpe patch should work like a charm.